Steiff 1934 Replica Teddy Bear Discounts Apply ! Made from the finest made of high quality Blonde Mohair. The sun seldom reaches the floor of Steiff�s Enchanted Forest, but when it does, magical things can happen. This 1934 replica was originally blond, but years of exposure to the sun has bleached him to a rich, creamy, vanilla. Doesn�t he look delicious? Even his felt paws have faded to become this most appetizing color. 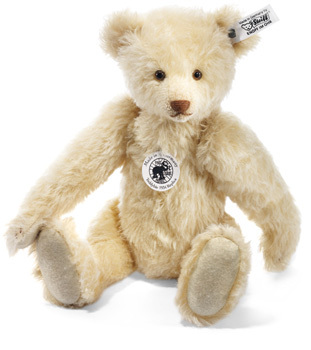 The 1934 Replica Teddy is made from finest Schulte mohair and stuffed with wood shavings from Switzerland. The original was in superb condition - with just a little dust around his muzzle - which our airbrush artisans have lovingly recreated. 1934 Replica Teddy, with its tall, elongated body so typical of the period, surveys the world through hand blown glass eyes. Fully Jointed with Gold Plated "Button in Ear". Glass Eyes, stuffed with wood shavings and Surface Washable.